This ALOS satellite image shows an area with extensive agricultural use in western Russia, with roads and rivers cutting through the cropland. 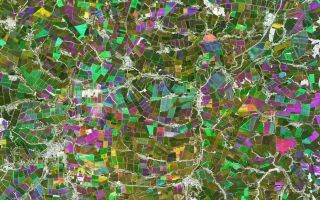 This ALOS satellite image shows an area with extensive agricultural use in western Russia, with roads and rivers cutting through the cropland in this cool space wallpaper. This area, part of Russia’s Black Earth Region, is about 400 km directly south of Moscow. Many grains are grown here, such as winter wheat and rye. This image is a compilation of three passes by the Japanese Advanced Land Observation Satellite’s radar on 14 June 2009, 14 September 2009 and 2 August 2010. Each image at the different recording date is assigned a colour (red, green or blue) and combined to produce this representation. The colours reveal changes in the surface between the satellite’s passes.